Most foreigners come to Santa Marta to experience the incredible surrounding nature. In between excursions to places like Tayrona, the Sierra Nevada or Punta Gallinas they stay in the center of Santa Marta or they go to Taganga, the popular fishing town north of Santa Marta. Nobody thinks of going south, to El Rodadero. Maybe it’s because no one knows it exists or maybe travelers are afraid because they read somewhere that El Rodadero is only for Colombian tourists. Who knows! I’m here to kill that myth and to show you why El Rodadero is well worth a visit. 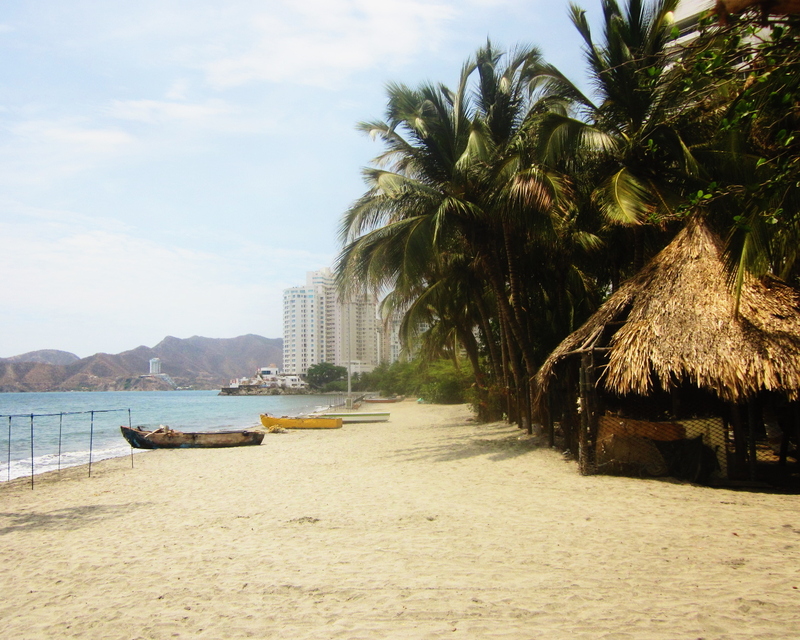 The beach in El Rodadero kicks the asses of both the beaches in Taganga and Santa Marta. 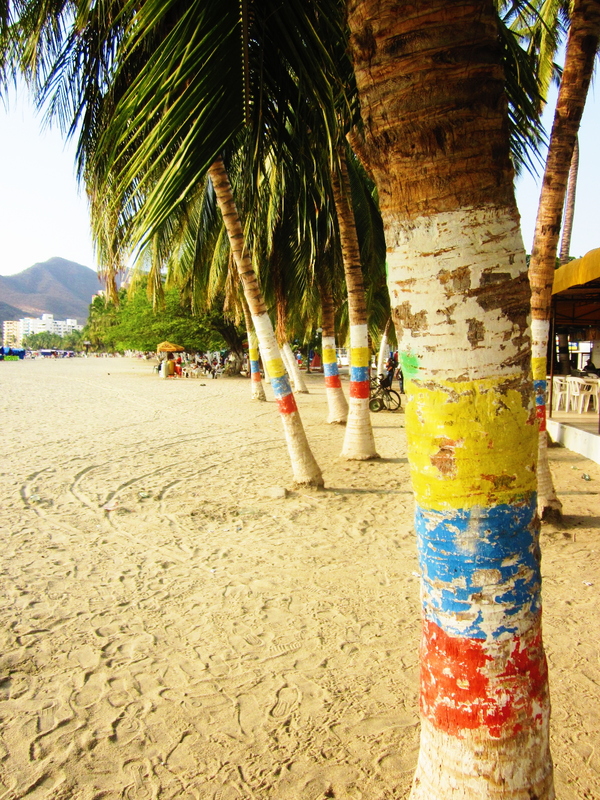 If you have been to Santa Marta you know that the beach and the harbour is esentially the same thing. Even though it has sand, no one wants to swim around right next to huge cargo ships. Then there is Taganga which is the preferred beach for travelers. It’s a nice stretch of sand with calm waters but it has fishing boats all over the place. You can also take the walk along the coast to Bahia Grande but that beach is more rocky than sandy. Compare these beaches to the one in El Rodadero and there is a world of difference. The beach in Rodadero is WIDE and LONG with clean white sand, plenty of space for everybody. Street vendors are everywhere so you don’t need to worry about snacks or refreshments. Do watch out for the guys in the palm trees cutting down fresh coconuts though! You can rent chairs, open tents and waterbikes to make your stay more enjoyable. But! That is not all, in fact this is the best part. All these things can be found in the northern part of El Rodadero’s beach but if you go further south something magical happens. The people disappear! Yes, you heard right, the southern part of the beach is just as good but almost empty. There are no vendors around but you pretty much have a stretch of premium Caribbean beach all to yourself! Just follow Carrera 1 south útil you come to a small bridge. The first parte of this beac is not so nice so keep walking until you get to the good part. El Rodadero is packed with restaurants and street vendors serving all types of delicious food. If you have money to spend go to Donde Chucho which is well known for its superb seafood or get some mouthwatering rainbow rolls at Sakura Sushi. If you are on a tight budget then try the arepas sold along the beach walk or have some salchipapas at one of the many Aguila stores. If you want to try something different you can go to Patacó on Carrera 17 where they make pizzas out of platanos and if you are in this area don’t miss Pateleria La Especial. 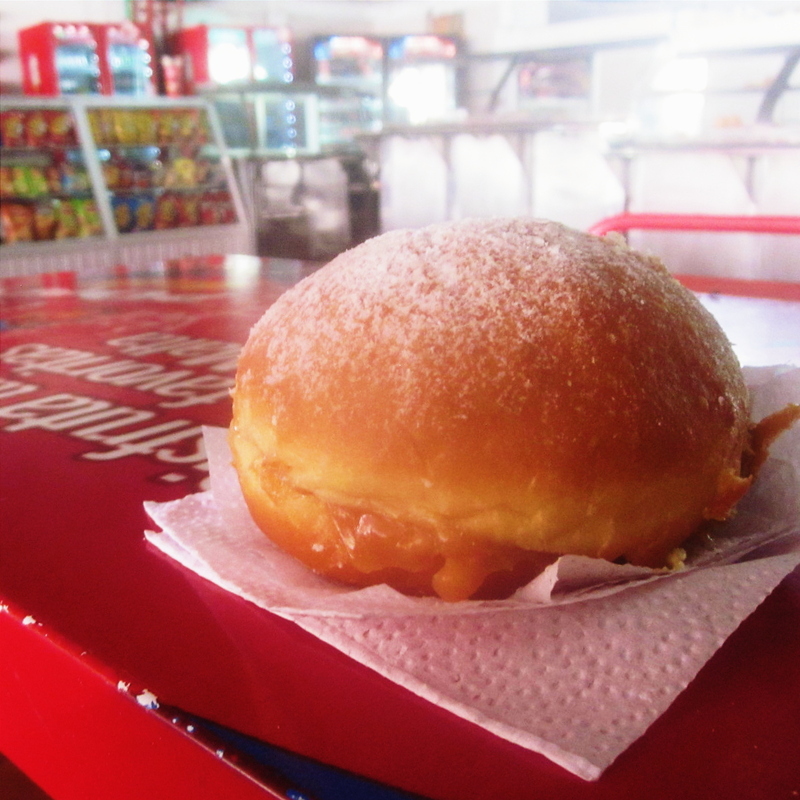 This is a bakery that is open 24/7 and they serve the best arequipe filled donuts you have ever had for only 1000 COP each! I know it’s not a donut, they ran out! The place that stands out is La Escollera, a Caribbean themed club located on a small island in the north of El Rodadero. The bar serves colorful tropical drinks and outside Iguanas run freely! Awesome atmosphere and they often have live bands playing. Not far from La Escollera you can find Burukuka which is both a bar and a restaurant. This place is located on the mountainside just north of the beach and it is best to take a taxi to and from here. The place has an amazing view of the coastline, very beautiful, don’t miss it! There are two ways to get to El Rodadero. Take a taxi which will be around 10.000 COP or take the bus which is 1400 COP. The bus departs from the corner of Carrera 4 and Calle 22 in the center of Santa Marta. Just ask for El Rodadero. The bus will take you over a mountain and when you arrive on the other side you are there. When you want to go back from El Rodadero you just take any of the busses that go in the opposite direction, they all go to Santa Marta.